If you are wondering how to remove Winn Extension from your browser, you have opened the right page. In this description, we will tell you more about this plug-in and where it comes from. Also, if you only want to know how to get rid of it, simply scroll down to the bottom of this article for the manual removal instructions. Please bear in mind that Winn Extension might be just one of the many unwanted applications currently installed on your PC. So if you want to know the exact status of your system security, you should run a full system scan with the SpyHunter free scanner. This browser extension works only on Chrome, and it has a rather dual nature. What we mean by that is that the extension looks legitimate, but it might also have specific features that are usually associated with potentially unwanted software. What’s more, our security experts say that the extension works like adware, so here you have even more reasons to doubt the application. 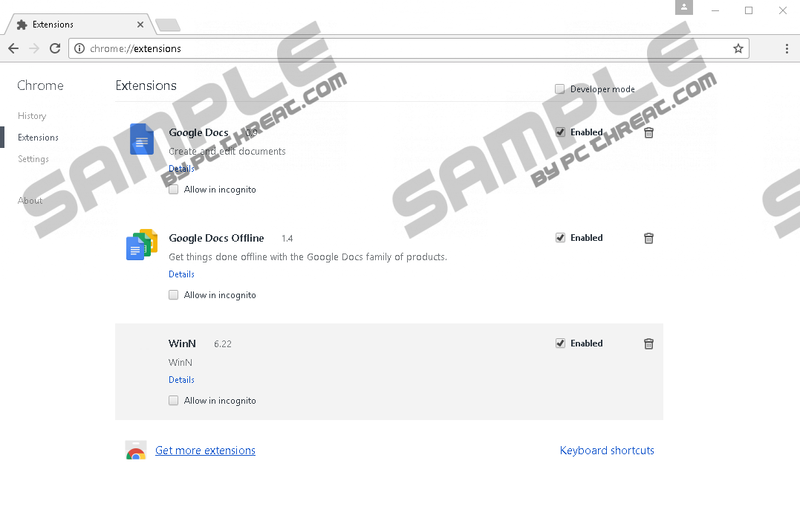 In a sense, Winn Extension does not enter your system surreptitiously, and it is you who needs to add it to your browser, but it is very often that users are not aware of the fact they install apps they should stay away from. It is possible to come across the extension in the Chrome Web Store. That would imply that Winn Extension is reliable and useful browser plug-in. However, there are quite a few potentially unwanted and harmful applications hosted on the official Chrome Web Store, and sometimes users add them accidentally. How to know that the extension you are about to add is not a good one? You should check the user rating and the reviews. If the extension has two stars or less, the chances are that nothing good can come of it. In Winn Extension’s case, the plug-in has only a rating of one star, so perhaps you should think twice before installing it. What’s more, Winn Extension can also be added from its official website via securetabs.website. If you get redirected to this website, it will offer you the extension automatically. By clicking Cancel, you would switch your browser into the full-screen mode that might look intimidating at first (especially if you are not used to this mode), and perhaps it pushes a few misinformed users into adding the extension. Do not let this aggressive behavior scare you. You do not need to add Winn Extension if you do not want to. On top of that, adding the extension to your browser would hardly improve its functionality. Of course, Winn Extension will say that it can help you watch various TV shows straight from your browser, but where is the proof? Seeing how the program is more of an adware application, it is very likely that you will see more commercial pop-ups than your favorite TV programming. And nothing good can come from pop-ups, especially when you cannot control them. Winn Extension offers advertising space for anyone. Any third party could make use of this application to promote their content. The same could be said about cyber criminals, too. Of course, malicious exploitation does not happen on a daily basis, but you should take all the potential threats into consideration. So if Winn Extension can deliver a commercial ad that contains an outgoing link, and if that outgoing link leads to a dangerous website, you need to cut off the medium. Meaning, you have to remove the extension before this situation escalates into something dangerous. Luckily, it is not complicated to remove Winn Extension. You just need to open the Extensions menu on your browser and remove it from the list. However, we should remember that this plug-in often comes bundled with freeware via pop-ups and random redirections. Therefore, you probably have a lot more programs and unwanted applications on your system that require your undivided attention. Rather than dealing with everything manually, be sure to acquire a security program that will terminate the threats for you automatically. You need to protect your system from similar intruders in the future, so an antispyware program is always your best bet when you need to invest in system stability. Open Extensions and remove WinN from the list. Quick & tested solution for Winn Extension removal.